Thai food in Melbourne can often be dull. There are a handful of places that are commendable, but the majority serve the same kaleidoscope of curries and dreadful deep fried entrees. Don’t start me on the frozen roti bread they attempt to revive in the microwave. 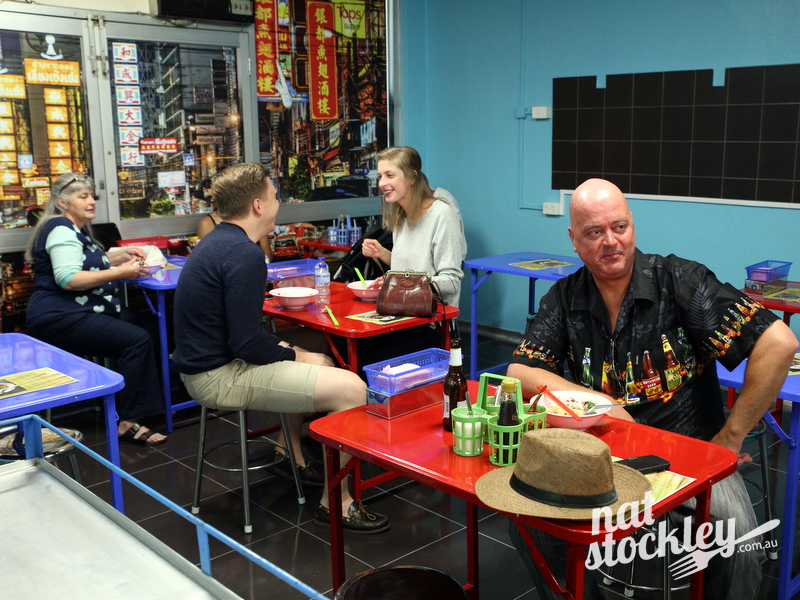 Take a trip to Bangkok and you’ll discover that the variety of food on offer is nothing like the monotonous set of choices in most of the Thai restaurants throughout Australia. One thing that’s apparent in Thailand is the enormous number of individual street vendors peddling one or perhaps a couple of signature dishes they’ve mastered over many years. Deriving its name from a famous street food precinct in Bangkok, Melbourne’s Soi 38 was born as pop up a few years back. Business partners Andy Buchan and Vherachid Kijthavee (Top to his friends) started showing up occasionally at various festivals and briefly had a residency at a rooftop bar in the Melbourne city. 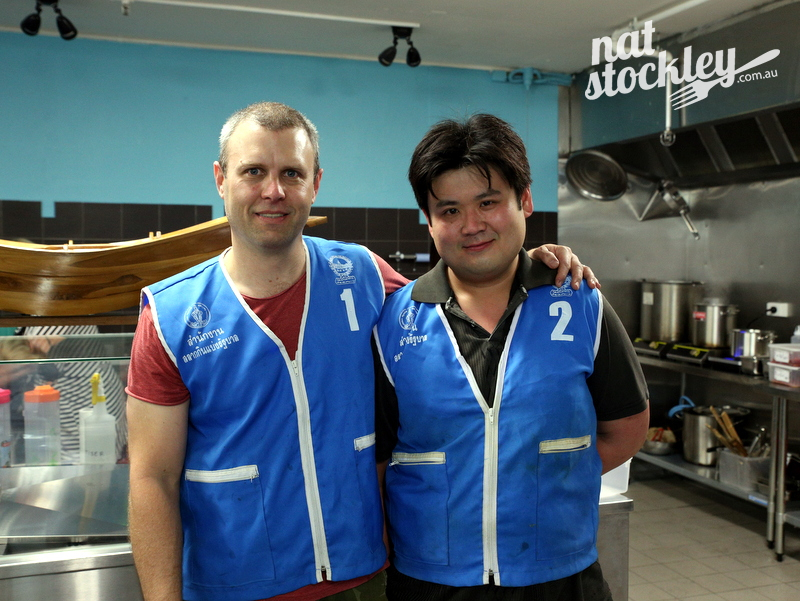 The emphasis has mostly been Thai noodle soups and this focus continues at their permanent shopfront at the base of multi-storey parking lot in the CBD’s McIlwraith Place. Here they’re serving boat noodles (kwaytiao reua) and tom yum noodles (kwaytiao tom yum). In keeping with the street food theme, the colourful tables and stools were sourced from Thailand to provide a genuine dining experience. 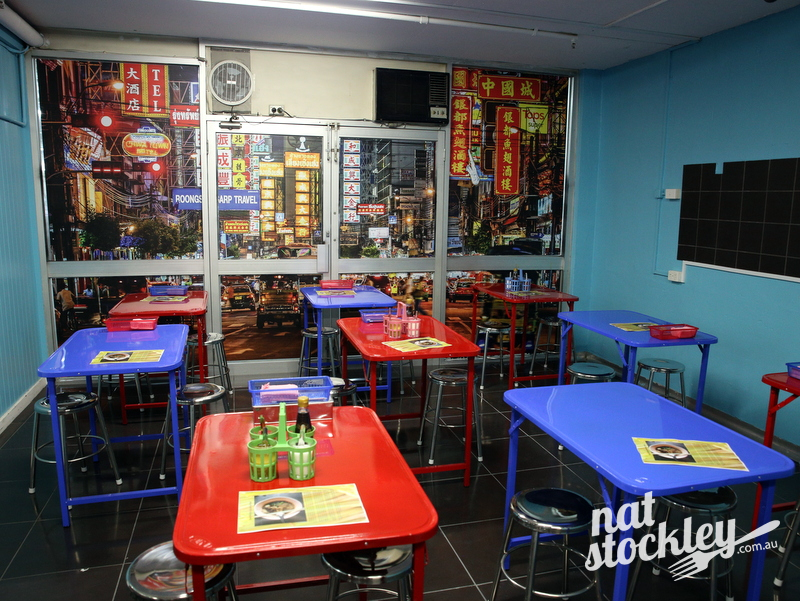 I’m not sure I’d be keen to perch on one of those stools for a multi course degustation dinner, but for a quick bowl of noodles they do the trick. 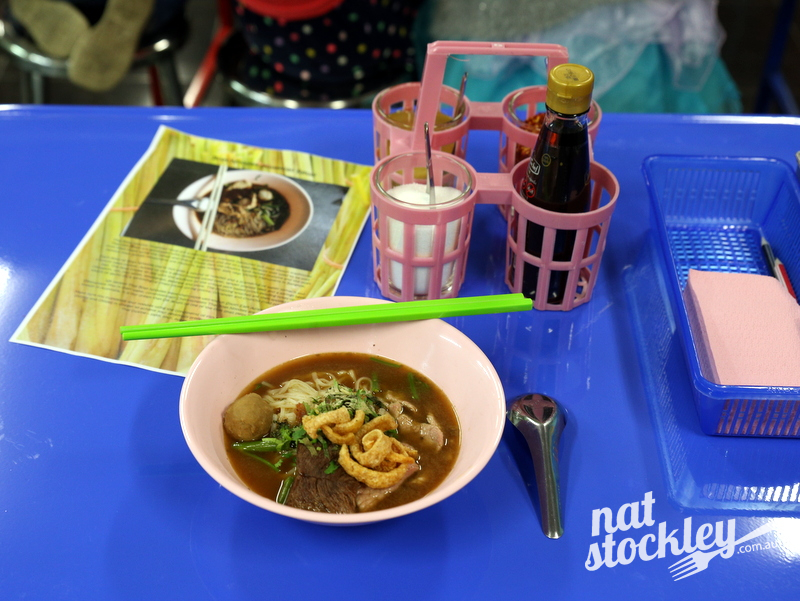 The boat noodles are available with either beef or pork. The tom yum noodles come with variations of pork & prawn. 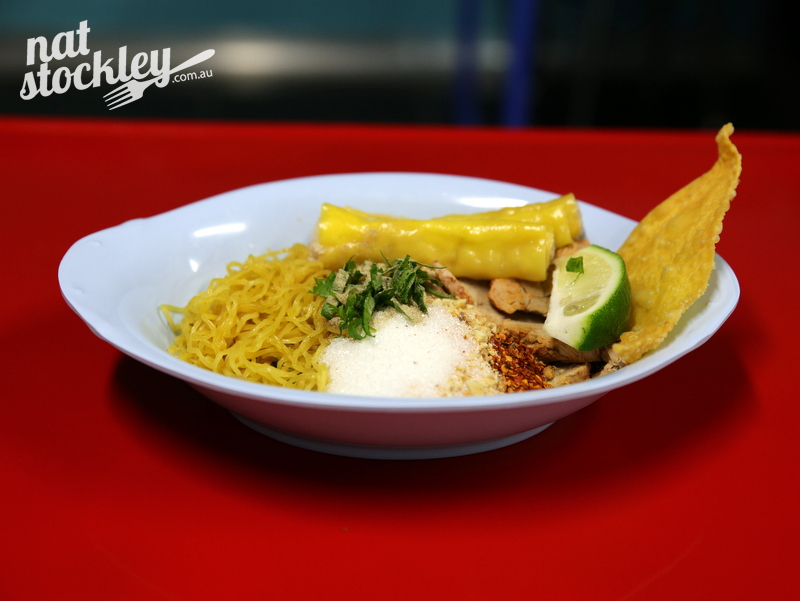 All the dishes are $10 and can then be shaped to your liking when you complete a simple order ticket nominating your preferred noodles and whether you’d prefer nahm (soup) or haeng (dry) or kruk krik (half soup). It’s worth noting that the dry versions contain some different seasonings, so there’s more to them than just deducting the broth. 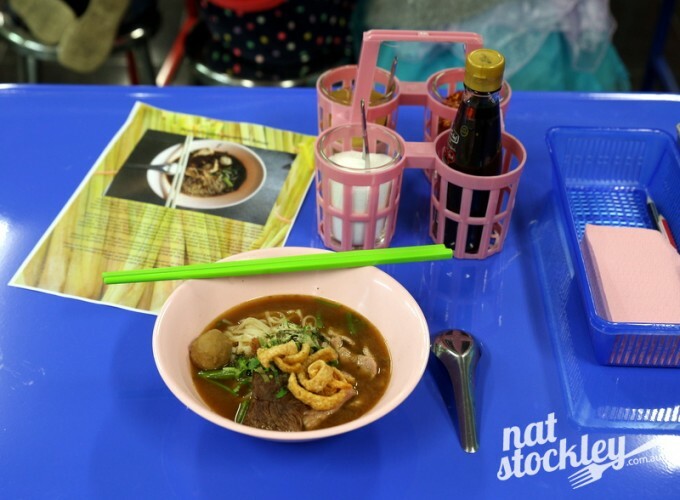 The popular boat noodle soup with beef comprises your preferred noodles, some water spinach and a few bean shoots. Gently cooked sliced beef is added along with tender slow braised beef and bouncy beef balls. 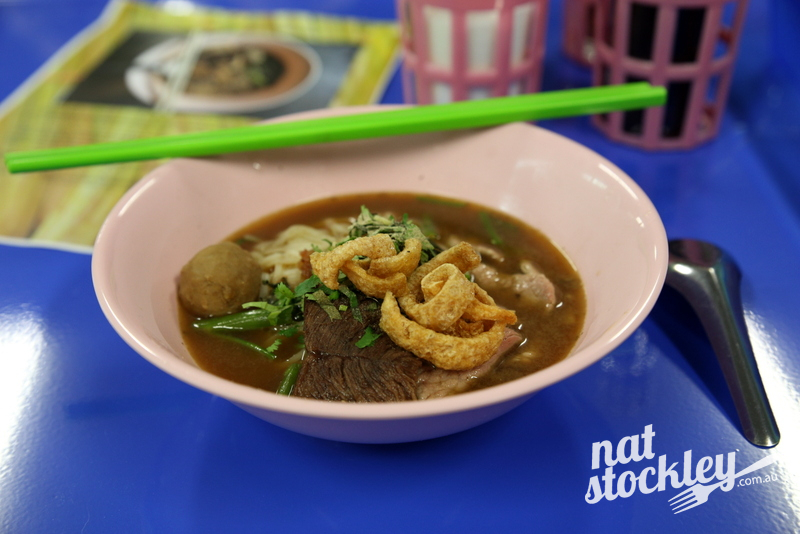 A distinctive pork stock fragrant with cinnamon, soy, star anise, lemongrass and galangal is poured into the bowl. Finally a touch of garlic oil, diced spring onion & coriander and a few crisp curls of pork rinds are added. The tom yum noodle soup is a completely different concept to that small bowl of tom yum with prawns and straw mushrooms you’ve most likely been presented at your local suburban Thai restaurant. The broth or stock itself is similar, but the bowl comprises your nominated noodles, pork mince, sliced pork, wontons and various seasonings. Diners get to fine tune their dish at the table by adding fish sauce, white sugar, crushed dried chillies or chillies in vinegar to give the salty, sour, sweet and spicy taste they desire. 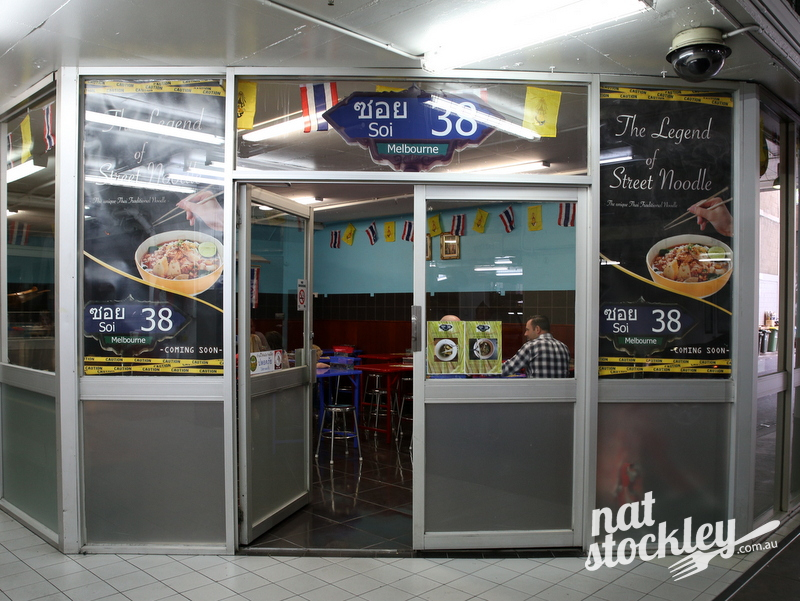 Soi 38 is currently open for lunch Monday to Saturday from 11am to 3pm.